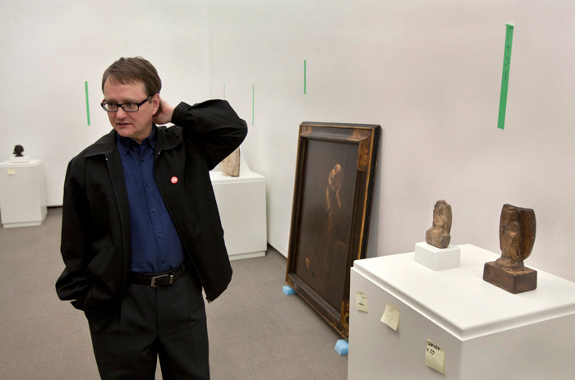 In 2012 Regina’s MacKenzie Art Gallery hosted an exhibition entitled Ruins to Renaissance - The Rise of the MacKenzie Bequest, curated by Timothy Long, Head Curator of the gallery. The show was a remarkable display of the artwork that was the original impetus behind the creation of the Norman MacKenzie Art Gallery, presenting the works chronologically in the order in which they were acquired by Norman MacKenzie, and creating a portrait of MacKenzie the collector and visionary. At his death in 1936, Norman MacKenzie, a Regina lawyer, left 374 art objects from all over the world to the University of Saskatchewan, along with a financial endowment in the form of properties and securities with a value of $64,425, accompanied by the wish that a gallery would be built in Regina to house the art collection. It was an astounding, unprecedented bequest, the result of MacKenzie’s audacious journey through the art world and global cultures, a journey accompanied by setbacks, swindles and natural disaster, but never regret. Born in Sarnia, Ontario, in 1869, the son of a provincial court judge, MacKenzie studied law at Upper Canada College before being called to the Ontario bar. But soon after, he travelled west, excited about the region’s potential, and at the young age of twenty-two he became the tenth man to enroll as a barrister in the North West Territories. After settling in Regina, MacKenzie quickly established a reputation as a court counsel. Then, in 1893, he entered into partnership with T. J. Brown and formed Regina’s most successful legal firm of the age. With no background in art or connoisseurship, MacKenzie also took great pleasure in reading about art and other cultures, and to this end he amassed a collection of over 700 books on art history and criticism, which is now housed in the Fine Arts Library at the university of Regina. 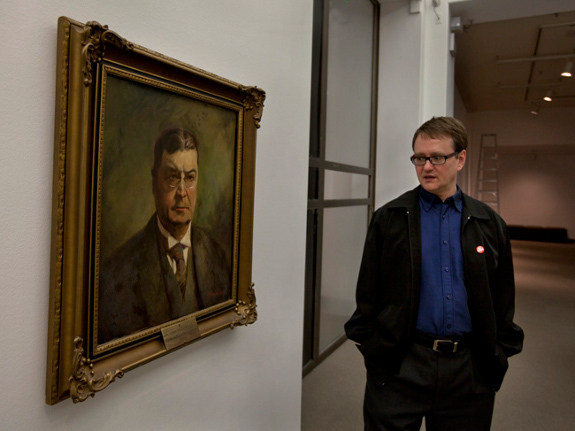 Curator Timothy Long with a portrait of Norman MacKenzie by Augustus Kenderdine. Painted shortly after MacKenzie's death, this is the final picture in the exhibition. But MacKenzie’s early endeavor to build an important art collection suffered a devastating setback on June 30th 1912 -- The Regina Cyclone, to this day the deadliest tornado in Canadian history, with twenty-eight fatalities, caused massive damage throughout Regina, including to MacKenzie’s home and his burgeoning art collection. 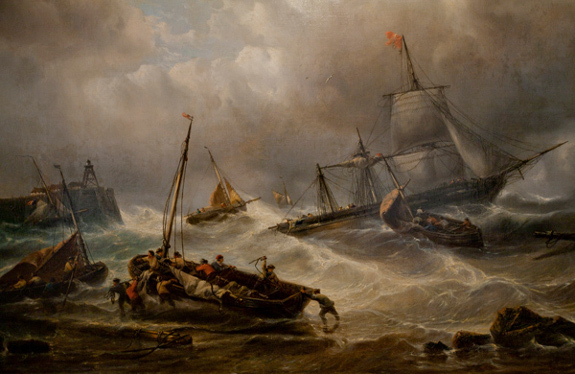 He lost hundreds of pictures -- the only piece that survived intact was Francois Musin’s Marine Scene (ironically a depiction of a violent storm), and this was the only pre-tornado purchase which MacKenzie bequeathed to the Regina Campus of the U of S, and now forms the centrepiece of the Ruins to Renaissance exhibition. Francois Musin's "Marine Scene", the only piece of MacKenzie's early collection to survive the 1912 tornado. This piece is situated at the entrance to the exhibition. But MacKenzie immediately set about rebuilding the collection, writing in 1913 to his London dealer W. M. Power: “I am buying pictures with the intention of leaving them to an institution here, and I do not intend to leave pictures supposed to be Old Masters as Old Masters where I have no proof to corroborate my statement.” The desire to replace the artworks lost in the tornado compelled the Regina collector and his wife Clara Erma McMorran (daughter of a United States Senator from Michigan) to embark on a world tour, the first of two such trips in which they acquired hundreds of artworks and antiquities. 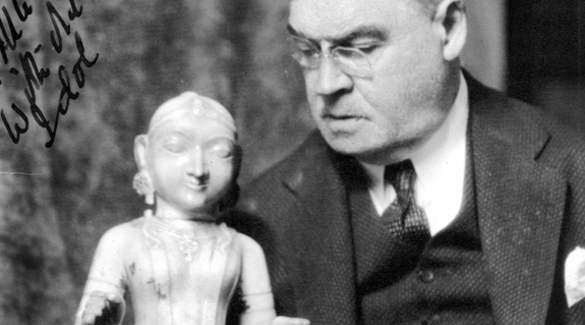 Among the pieces collected by MacKenzie were many religious sculptures. In fact, on his first trip to Asia he had an image of a Hindu god Vishnu stolen for him by a local Hindu in Benares, even though he knew that “it was a serious offence, and I would have gotten into trouble with the British Government.” In the Ruins to Renaissance exhibition there are at least two authentic stelae -- carved and inscribed upright stone slabs -- that would have originally been used as grave stones, then later likely used as other commemoratives and markers. Ultimately, MacKenzie’s collection would span the world and span the ages. His initial main interest was Old Master paintings of the Italian Renaissance, for he considered them to be high art. The romanticism of this art inspired his passion for collecting. He was obsessed with acquiring works by artists such as Michelangelo, Leonardo da Vinci, Andrea del Sarto and Titian. Had he been more familiar with the art market, he would have understood that works by such artists were rarely available on the open market, and certainly not for the amount of money he was able to pay for them. As he became ever more determined to accumulate a meaningful art collection, MacKenzie, assisted by Clara, travelled extensively and cultivated contacts among European art dealers. However, unfortunately some of the dealers MacKenzie encountered did not have his best interests at heart. One such dealer was J. Purves Carter, an English restorer and self-proclaimed expert resident in Florence. In 1915 a mutual contact introduced the two men after Carter’s deal with a Vancouver art collector fell through, leaving the dealer stranded with three paintings and owing money. 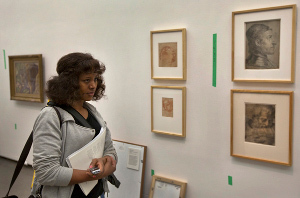 MacKenzie bought the pictures, which Carter claimed were by Titian, del Sarto, and Francia (the attribution for all three pieces would be disproven in following decades). This marked the beginning of a friendship that lasted 15 years, during which MacKenzie regularly purchased artworks from Carter. In Carter’s letters, MacKenzie found an intimate contact with the art world to which he was new, through the eyes of a supposed insider. The dealer wrote long gossipy letters informing the isolated Regina collector about the intrigues and machinations of the art world, dropping names of famous collectors, artists and experts. During the depression of the 1930’s, the art market suffered tremendously and a destitute Carter turned to MacKenzie for financial help. After failing to secure Carter a lecturing post in Regina, MacKenzie started paying him a monthly stipend of $100 for two years. Of the three paintings MacKenzie acquired from Carter in their fateful first transaction, the one which was attributed to Titian is the only one which remains in the MacKenzie collection. Norman MacKenzie eventually gave the Francia to the local Roman Catholic Cathedral, while the del Sarto suffered a less kind fate: it was painted on wooden panel and cracked under the extreme dryness of the prairie climate, so MacKenzie was forced to return it to Carter in Italy, receiving a lesser painting in exchange. Nobody expected genuine works of Renaissance masters to be found in Regina but Carter reassured his client that he was getting “finer things than the richest men are getting in the States.” Carter was a firm believer in “instinct” as the primary test for authenticating Old Master paintings, and thus MacKenzie suspended his demands for authentication. After all, Carter was buying from old families fallen on hard times and asking about the work’s history would show too much interest and drive up the price! Curator Timothy Long during the installation of the 2012 show. 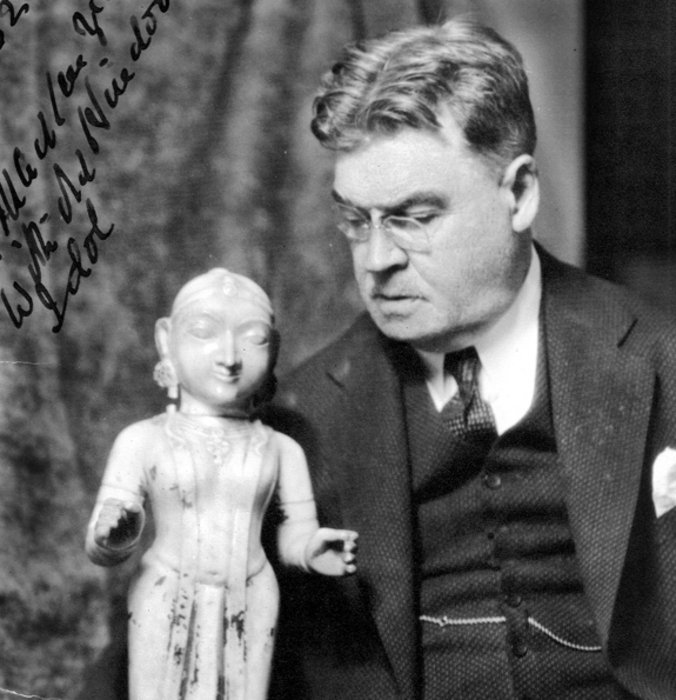 When MacKenzie was elected to the Board of Trustees of the National Gallery of Canada in 1925 (the first westerner to be so chosen) he came into contact with more seasoned collectors who questioned his acquisition methods. As it turned out, his beloved Saint Sebastian was indeed a copy. As a matter of fact, each of scores of artworks acquired through Carter was of dubious value and questionable attribution. After 1930 MacKenzie ceased dealing with Carter. The last transaction between them appears to have been the purchase of a Salvador Rosa panel in 1929. MacKenzie paid Carter $1,300 for the artwork, but when a European collector offered him $10,000 for the same piece Carter tried to get out of the deal until MacKenzie threatened legal action. In fact, not all of the drawings MacKenzie purchased through his new and respected London dealers have lived up to their original attributions either, but most are of very high quality. MacKenzie left his most outstanding purchase, The Death of Adonis, a painting which was attributed to Van Dyck, to the National Gallery of Canada. The gem of his University of Saskatchewan bequest, however, is the small Study for the Assumption in S. Trinita dei Monti, a preparatory work for a mural in a Roman church by the renowned 16th century painter Federico Zuccaro. Also in the MacKenzie bequest is a larger cartoon, the Preparatory Study for the Pentecost by Piers Francesco, as well as other fine examples of Old Master draftsmanship including a drawing of the Head of the Madonna that was originally thought to be by Volterra and the black chalk sketch Profile of Head of Man in Armour, which MacKenzie originally purchased as a Veronese. 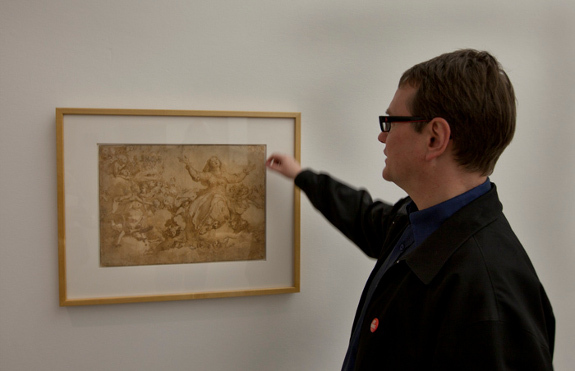 Timothy Long with the "Study for the Assumption in S. Trinita dei Monti, Rome" by Frederico Zuccaro, one of the most important pieces in MacKenzie's bequest. Even though MacKenzie’s deep interest in Old Master works never eased, he did include other genres and periods in his collection. Among these were Canadian art, such as the works of Arthur Lismer and Inglis Sheldon-Williams; North American Indigenous art; Modern Continental art such as German Expressionist prints; art of the ancient period including prehistoric, Mesopotamian and Egyptian works; African art; and Asian pieces from India, China, Korea and Japan. MacKenzie really connected with Saskatchewan’s active contemporary painters whose works he liked, to the extent of visiting them in their studios and making suggestions concerning paintings he intended to buy. The most outstanding example of MacKenzie’s involvement in the creative process of a painter was when he suggested that Illingworth Kerr paint for him a tiger. The enthusiastic MacKenzie bought tickets for Kerr to see the circus and provided an old tiger skin in his possession so that the artist might “stretch it out on some bushes so as to get the light and shade correct.” Kerr was uncomfortable with this degree of attention from the collector but took the commission because he needed the money. When MacKenzie called him to find out how the work was going, the artist told him that it was finished and he could come pick it up the next day. He had in fact, not started on the painting at all. The finished painting, now in the MacKenzie bequest was the result of one night’s work. But the fact remains that artists like Henderson and Kerr benefitted enormously from MacKenzie’s patronage and fellowship, with MacKenzie even recommending their works to the National Gallery of Canada. Also, MacKenzie, a great admirer of the culture of the Plains Indians, appreciated depictions of Canada’s First Nations Peoples as a record of that culture. To that end, he collected a series of First Nations portraits by James Henderson, who even more than Sheldon-Williams spent time in First Nations communities obtaining experiences first hand. It was Norman MacKenzie’s own directness of purpose which resulted in his remarkable bequest to the people of Saskatchewan, and in its lasting significance to our self-understanding. His foresight was exceptional for his day and his legacy lives on in the Norman MacKenzie Art Gallery, one of the leading galleries in western Canada. “It is damp and dreary and gives one the feeling of depression....and I spent the whole day moving from one picture to another. I do not see how people get along who do not appreciate art.” Norman MacKenzie, 1925, in a letter to J. Purves Carter. 1869 - Norman MacKenzie is born in Sarnia, Ontario. 1891 - MacKenzie enrolls as a barrister in the North West Territories and moves to Regina, which at the time boasts a population of 1,500. 1893 - The young lawyer enters into a partnership with T. J. Brown. Together they form Regina’s foremost legal firm of the period. 1900 - MacKenzie starts enthusiastically collecting art, following the tradition of British civic-mindedness. 1909 - MacKenzie marries Miss Clara Erma McMorran, daughter of Harry McMorran, a United States Senator from Port Huron, Michigan. 1912 - An enormous tornado, the Regina Cyclone, reduces much of the city to rubble and destroys hundreds of MacKenzie’s pictures. 1913 - MacKenzie sets about rebuilding his collection, and he and Clara embark on the first of two world tours in search of art and artifacts. 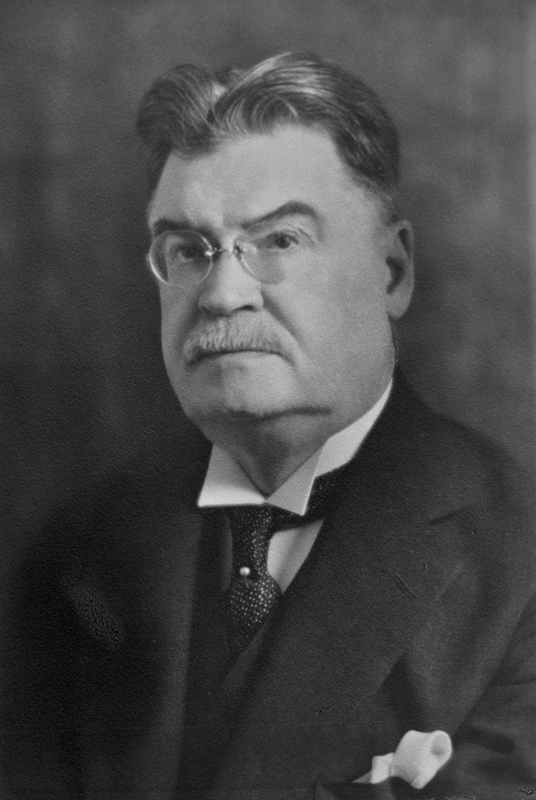 1925 - MacKenzie is elected to the Board of Trustees of the National Gallery of Canada, becoming the Board’s first representative from the West. 1930 - As MacKenzie’s health begins to weaken, his doctor orders a break from work, and MacKenzie and Clara make a four-month trip to China. 1935 - MacKenzie is appointed permanent chairman of the Art Committee of the Regina College. 1936 - Norman MacKenzie dies on January 2, after several months of poor health. 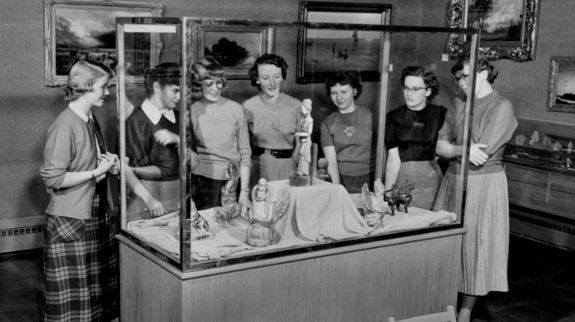 1953 - The Norman MacKenzie Art Gallery opens on the Regina Campus of the University of Saskatchewan (later the University of Regina). 1990 - The gallery separates from the University and moves to its current location in the T. C. Douglas Building, in Regina. Iryn Tushabe is a Regina-based writer and filmmaker, and a 2012 participant in the Banff Centre program Women in the Director’s Chair. Iryn’s writing has appeared in The Regina Leader Post and The New Vision (Uganda).